Want to learn more about fall mulching, specifically why you should add mulch to your garden beds in the fall? Mulching is a garden maintenance task that can help your plants thrive for many years. Other fall garden tasks include pruning, weed control, and possibly pest prevention. 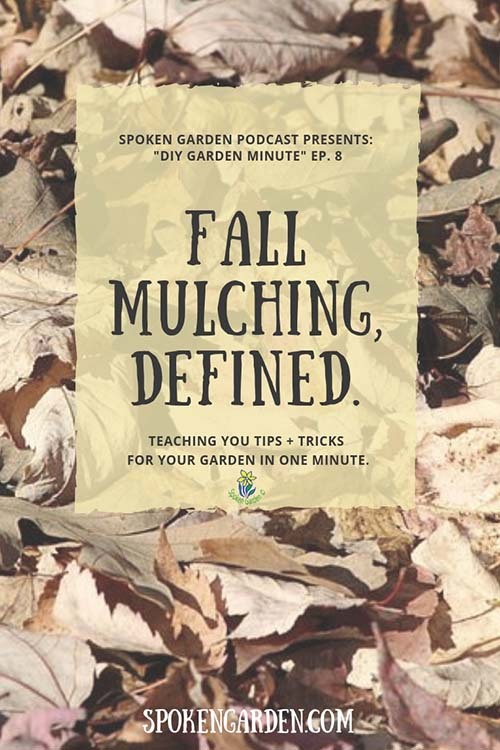 Listen to our quick segment on this "DIY Garden Minute" to learn about fall mulching and hear several reasons why you should mulch. This episode is for those of you newbies to more advanced gardeners who need help with mulching. Subscribe to our Spoken Garden community and receive a FREE mulching cheat sheet! Included in the cheat sheet for you: Tools you will need for proper mulching, how to measure mulch, and steps to mulch successfully! And hey—before you head out—if you want to connect with us and subscribe to our newsletter go to Spoken Garden's free resource page! We have FREE garden content we are so excited to give to you, like cheat sheets, plant profile sheets, etc! See you there! Save "Fall Mulching, Defined" directly to your Pinterest page for later! Learn why you should think about mulching this fall. Reasons why you should mulch in the fall. DIY Garden Minute Ep.7: Mulching Basics Explained!